To create a new form object, first locate the type of object you want to create in the Object Library. In this example, we’ll create a new star object. Now drag the object from the library onto the position where you want it placed in the form. There is also an alternate method for creating a new form object. 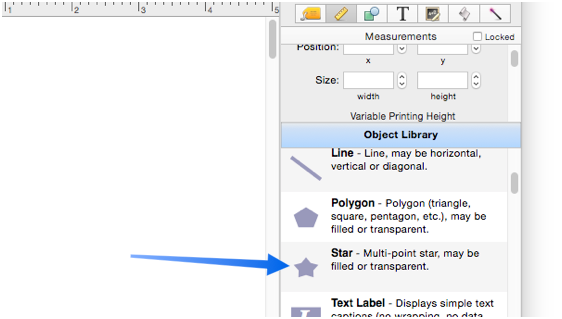 Instead of dragging the object from the Object Library, simply double click on an object in the library. This will create a new object in the center of the visible form. When you use the double click technique, you can’t control where the new object is positioned on the form, but once it is created you can move it wherever you want. 10.0 Updated Carried over from Panorama 6.0, but now done with Object Library.